I was a road warrior for years (as many as 100 hotel nights per year), tethering to a Windows Phone based device in 2004, which I remember having to use the reset pin on frequently, and it liked to overheat and reboot spontaneously when used for data. More recently, my travel kit included USB cellular modem with external antennas to be positioned near customer's or hotel room windows. 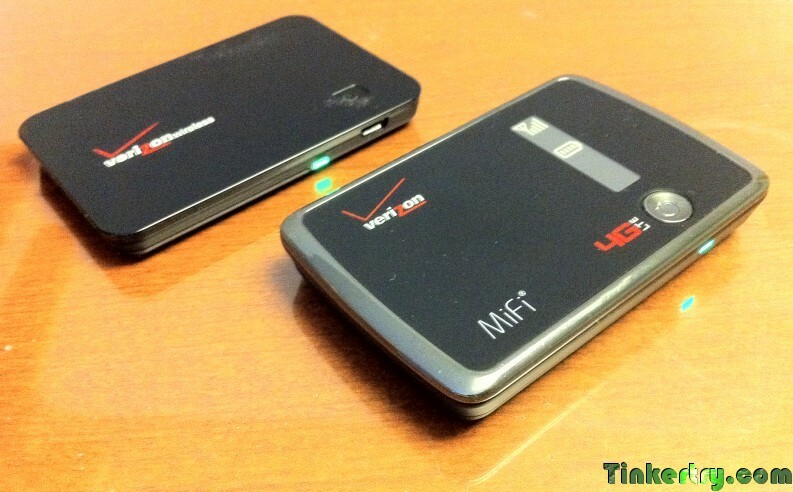 In 2009, I got the Verizon MiFi 2200 (sort-of-unlimited 3G), then the MiFi 4510L (Verizon 3G/4G LTE, 10GB/month capped), much handier when shared with family on occasional road trips as well. I've even used the 4510L to broadcast a live event over Ustream the very week 4G via LTE became available in my neighborhood, and had excellent results, for 90 minutes straight. Overall though, it's been a pretty rough road these past 5 years or so, trying desperately to avoid typically lousy hotel WiFi (free tends to be even worse). I often had to download AND upload 650MB CD ISO image files, as I prepped for complex customer visits all over the country, and it's crucial to have decent bandwidth that I bring with me, since I often cannot join customer guest networks. I also required a good fat pipe for uploads to the intranet over VPN, for collaborating with colleagues. I plan to blog more about my many sordid 3G/4G experiences here soon, some great experiences with screenshots of pretty amazing speed/latency measurements. Meanwhile, detracting from all that LTE (potential) goodness is a problem that I'm actively working on with Verizon support. My MiFi 4510L's 3G or 4G connection is going dormant (for power savings), even when my devices are connected and in use. This can be seen by looking at the status with a browser pointing to 192.168.1.1, and noticing the green/purple light on the side stopped blinking. This behavior is really annoying, work around is to disconnect and reconnect in the 192.168.1.1 interface, or power cycle the device (a 45 second proposition). This issue has been going on for months, and has been reported to Verizon. Time will tell how this works out, hoping a firmware eventually gets released that addresses this, then I'll be quite happy with this device. Verizon Support shipping me a Samsung 4G LTE Mobile Hotspot SCH–LC11 to try for 5 days, not exactly rave reviews (for either device actually), will have to see how it goes (and test it heavily). Here's reviews by Verizon Account holders (you have to login), 3 stars of 5 stars for SCH-LC11, whereas teh 4510L gets 3.5 stars of 5 stars. Verizon, it turned out, didn't have stock of the Samsung 4G LTE to ship to me, I said let's hold-off, as reviews on it were worse, and this feels like a firmware problem, given it's now clear the dormant issue only happens with Apple iOS devices. When using with laptops, the 4510L stays locked on for hours, stationary or mobile. Still no updates from Verizon, still no answers on their forum. Verizon now has a firmware update available. After the upgrade from FW 2.16.03 to FW 2.16.07 today, I put the unit back at factory defaults, and am testing now to see if the 4510L still goes dormant, a problem which seems to happen more often when just Apple (iOS) devices were attached (with PC laptops attached, it'd stay locked on for days (powered by UPS), waking from dormant as needed during the hurricane power outage, for example). so for now, here's the cached version from Google. As of 04:40pm eastern time, I've been doing 2 solid hours of streaming, using at factory default settings. No disconnects or interruptions, so preliminary analysis is that this firmware is much better and keeping my 4510L from going dormant and not waking up properly during normal use, this is good.